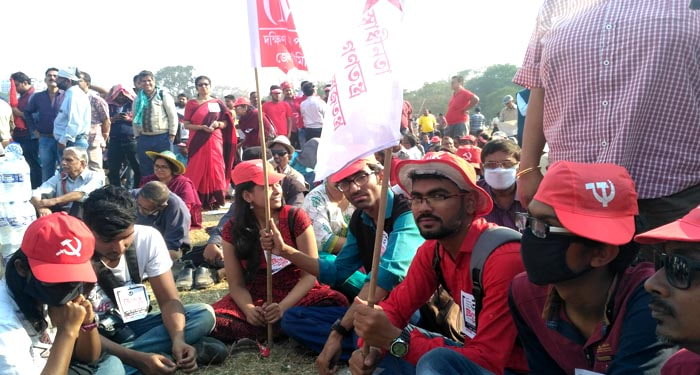 Many such young groups of Left cadres were a new phenomenon at the rally today. 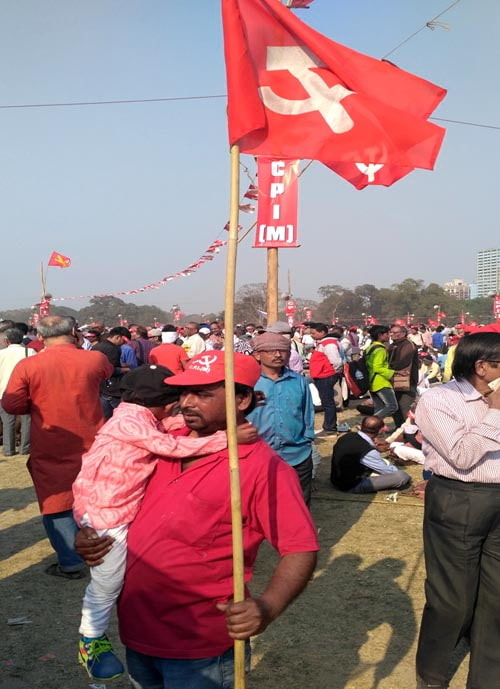 Kolkata: Left Front’s much-publicised rally in Kolkata today fell short of attracting enough crowds to fill up the Brigade Parade Ground but it has thrown up a new possibility for the electorally beleaguered force. On one hand, with the presence of the leadership of CPI-ML (Liberation) on the stage, the rally has sown the seed for broadening the Left Front ahead of the coming Lok Sabha polls. 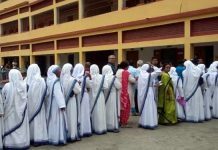 On the other hand, the presence of a large number of youths ~ both girls and boys ~ at the rally could be an indication that the Left in Bengal, especially the CPI-M, could gain enough strength to take on the Trinamool hegemony writ large in the state since 2011. In fact, a major chunk of the crowd at Brigade rally today was young college and university students from all over the state. At the front of the gathering, that is, towards the stage, it was young Left cadres who comprised the majority of the audience. Sitaram Yechuri (white shirt) clicks a photo on his mobile as Bengal CPI-M secretary Surjya Kanta Mishra speaks at Brigade Rally on Sunday. 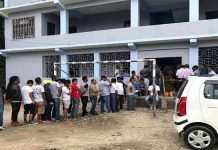 They ardently listened and cheered during the speeches by Left’s national leaders Sitaram Yechuri of CPI-M, Sudhakar Reddy of CPI, Debabrata Biswas of the Forward Bloc and, non-Left Front guest speaker Dipankar Bhattacharya of the CPI-ML (Liberation). Middle-aged and senior Left supports and cadres were seated towards the tail of the Brigade Parade Ground. CPI-ML (Liberation), a Naxalite political party which was once mostly critical of the Left Front government when they were in power, participated in today’s rally for the first time since 1993. 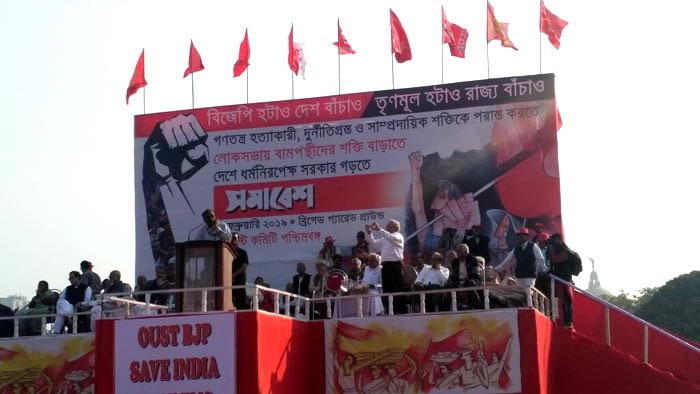 There were another 17 smaller non-Left Front parties who attended the gathering but it was only Liberation national general secretary Dipankar Bhattacharya who was present on the dais and addressed the rally. Liberation has a sizeable support base in Bihar and, its student wing is active in Delhi’s Jawaharlal Nehru University. The last time the party leadership shared stage with CPI-M at aa Brigad rally was in 1993, which was organised by a broader platform named Indian People’s Front formed in the aftermath of Babri Masjid demolition. Speaking at the rally today, Liberation general secretary said that Bengal needs a new Left alternative to replace the ‘tyrannical’ Trinamool regime and to stop the march of ‘communal’ BJP. “We wanted a broad-based Left coalition during the 2016 Bengal Assembly polls which didn’t happen. But better late than never; let bygone be bygone. 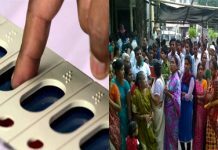 All the Left-democratic forces must come together for the 2019 Lok Sabha polls,” he said. In his speech, CPI-M general secretary Sitaram Yechuri warned the Trinamool that Left cadres will no longer face their atrocities lying down. “Let me warn you, if our cadres are assaulted anymore, not only there will be protests, there will be a fiery resistance,” Yechuri said.